Jalal al-Din Rumi, was born in Balkh 1 on the 30th September, 1207. His proper name was Mubammad, title Jalal al-Din and later "Khudawandagar", "lord". 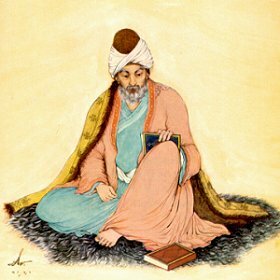 In his poetry he used the pen-name "khamush" (meaning "silent") and from the 15th century came to be known as Mawlawi, the term deriving from his earlier title of Mulla-yi rum, "the learned master of Anatolia". His disciples, such as Ahmad Aflaki called him "The Greatest Mystery of God" (sirr Allah al-a'zam), while the Persian speaking world usually refers to him as Mawlana. In the West where his fame has spread steadily since the 19th century he is usually known as Rumi, (meaning from Roman Anatolia). Rumi's father Muhammad ibn Hussain Khatibi, known as Baha' al-Din Walad (entitled Sultan al-'ulama'), was an outstanding Sufi in Balkh. He is the author of the Ma'arif 2, a masterpiece of Sufism, which left its mark upon Rumi's Mathnawi. When Rumi was about twelve or thirteen years old (around 1220), Baha al-Din Walad left the eastern provinces of Persia with his whole family and a group of disciples and travelled westward. This may have been as a result of the threat of invading Mongol armies. It is said that in Nayshapur he met the renowned Persian Sufi poet Farid al-Din 'Attar and presented Jalal al-Din to him. Apparently Sheikh 'Attar was very impressed by the young Rumi, and told Baha' al-Din Walad, 'soon this son of thine shall set the spiritual aspirants of this world afire'. From Nayshapur Baha' al-Din Walad and his entourage set out for Baghdad where they were highly respected, meeting many of the scholars and Sufis of the city. From there they went to the Hejaz and performed the pilgrimage at Mecca. It was after this journey that most likely as a result of the invitation of 'Ala', al-Din Kayqubad, the ruler of Anatolia, Baha' al-Din came to Asia Minor and finally settled in Konya, a city associated with his family to this day. The family of Baha' al-Din Walad was welcomed warmly in Konya, which was witness at this time to many immigrants from the eastern cities of Persia, since Anatolia offered a peaceful haven in the Islamic world during the turbulent years of the Mongol invasion. Baha' al-Din rapidly gained fame as a religious scholar and Sufi and died with honor when Rumi was 24 years of age. Around a year after his father's death, Rumi met Burhan al-Din Muhaqqiq Tirmidhi, a Sufi master of high quality who was himself a disciple of Baha' al- Din Walad. It was through Burhan al-Din that Rumi inherited the spiritual heritage of his father and became initiated into the mysteries of Sufism. For nine years Rumi practiced Sufism as a disciple of Burhan al-Din until the latter died in 1240-1. During this period Rumi also travelled to Damascus and is said to have spent four years there. Having become a master of both the Shari'ite sciences and Sufism, Rumi established a circle around him in Konya, and from around 1240 to 1244, he was occupied with teaching, meditating, helping the poor, and other activities of a religious scholar. It is said that he was a popular teacher and that as many as four hundred students attended his formal classes. In 1244 Rumi's life was transformed through his encounter with Shams al-Din Tabrizi, who had entered Konya that year after spending some time in Baghdad. Shams was a mysterious and powerful Sufi, who fled social connections. Even his death remains a mystery and he has several tombs which have remained sites of pilgrimage, to this day. There is no doubt that Shams al-Din Tabrizi was not just a Sufi master for Rumi. Jalal al-Din had already practiced Sufism for many years before meeting Shams al-Din. It seems, rather, that Shams al-Din had a spiritual influence on him. Rumi was the type of Sufi who needed spiritual companionship in order to express himself in words. The companionship that Shams al-Din provided, was so powerful that it transformed the sober teacher Rumi, into an ecstatic poet. The first poem ever written by Rumi is in a letter to Shams, and from the time of their encounter until Rumi's death, the latter never ceased to compose poetry. The spiritual, friendship between these two towering figures is rare in the history of Sufism and has become proverbial in the East. I have been searching for myself! Rumi returned to Konya, began his open instruction of Sufism and devised the spiritual dance (sama), for which the Mawlawi order has been famous for the past seven centuries. The rest of Jalal al-Din's life from 1249-50 to 1273 was the period of dissemination of Sufism and the esoteric sciences contained in it. He trained numerous disciples, some of whom like Salah al-Din Zarkub Qunyawi and Husam al-Din Chalabi were themselves spiritual guides. According to Rumi, Husam Chelebi was the one who understood the vast, secret of the Mathnawi, that great work that shifts so fantastically from theory to folklore to jokes to ecstatic poetry. For the last twelve years of his life, Rumi dedicated the six volumes of this masterwork to Husam. How doest thou know what sort of king I have within me as companion? Do not cast thy glance upon my golden face, for I have iron legs. He died on the 17th December 1273 in a state of joy and peace surrounded by his spiritual progeny, which also included his closest family. Sadr al-Din Qunyawi, the other great master of Sufism in Konya at that time, read the prayer of the dead before the body and the earthly remains of the greatest Sufi poet of the Persian language was laid to rest in Konya. His tomb remains to this day, is one of the most important sites of pilgrimage in the Islamic world, a second Ka'ba for the Sufis and the spiritual centre of Turkey. "An Insight into Rumi's Works"
1- In Jalal al-Din Rumi's time, Balkh, which was a major centre of Persian culture, was part of the Persian Empire. Today, it is in Afghanistan. 2- The Ma'arif is a collection of notes, sermons, and unusual accounts of visionary experiences. In it Baha' al-Din Walad shows a startling sensual freedom in stating his union with God.